Soon after Chancellor Engelbert Dollfuss found a way to dismantle Austria's parliament in March 1933 and institute a fascist government in Austria, he created the Vaterländische Front (Fatherland Front, also known as the Patriotic Front) to replace political parties that were "faithful to the government." 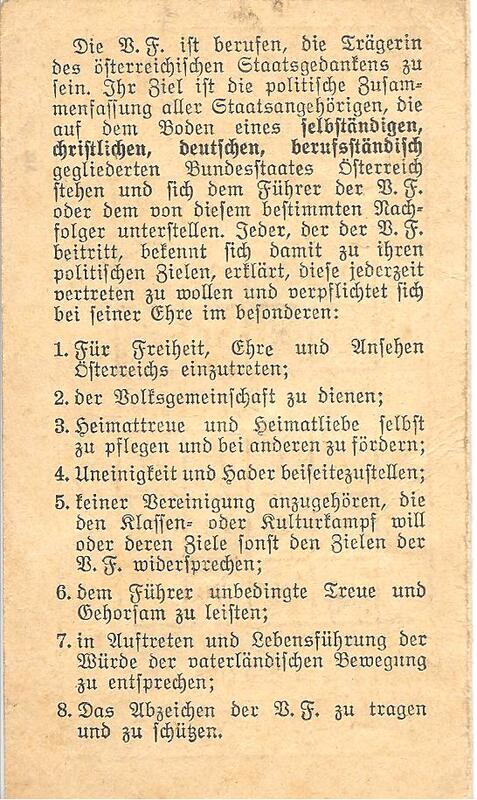 Within a few months, all other political parties were banned and many of their leaders were in concentration camps. 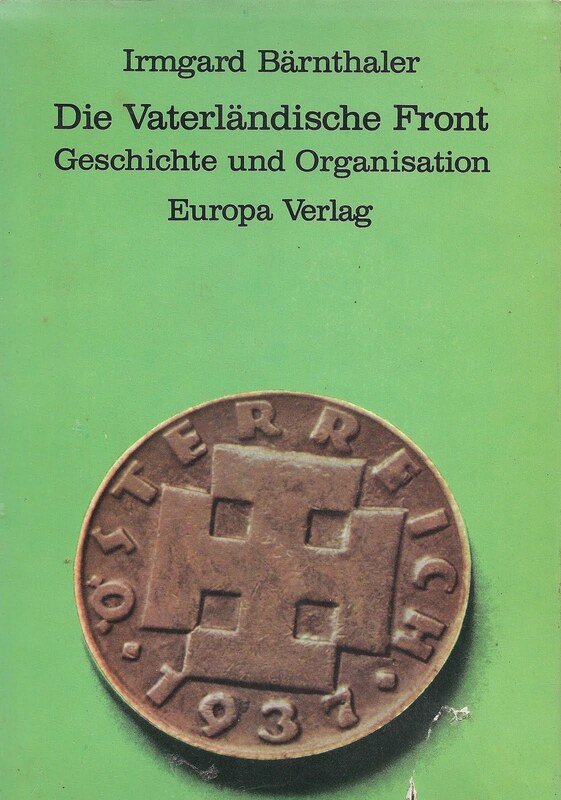 In retrospect, Austria's Fatherland Front seems to be a bit comical, though at the time it was a deadly serious organization. The group, created by Dollfuss in May 1933, was a pale imitation of the fascist organizations of Germany and Italy, which encompassed the such things as a totalitarian government united behind a larger-than-life leader (Il Duce, Der Führer); nationalism founded on myths that justified an idealized view of the country, its people, and its destiny; and a militarization of society designed to make warriors of citizens and use violence against its opponents. In contrast to the National Socialist Party in Germany and the National Fascist Party in Italy, Austria lacked a ruthless, ideology-driven leader plotting destruction of its opponents and conquests of its neighbors. Dollfuss, was, by most accounts, a likable and decent man -- hardly terms that would have been used to describe Hitler or Mussolini. Also, he was a small man, 4 feet 11 inches. While no one doubted Dollfuss' courage, which he displayed as an officer in WWI, his small stature could not have helped the efforts to make him an awe-inspiring leader. After Dollfuss' assassination in July 1934, the new Führer was Kurt Schuschnig, a mild-mannered lawyer with distinctive owlish glasses that made him look like a professor. Again, no one could doubt his courage, as shown in his last-minute effort to save Austria from Hitler. However, he did not have the look or harsh rhetoric of a ruthless dictator. The Austro-Fascists and the Fatherland Front did its best to live up to the standards of Germany and Italy. And many of its leaders were as vicious and ruthless as any in those countries. They crushed the socialists in a short civil war (firing artillery shells into buildings that housed workers), hung some of their opponents (mostly socialists), imprisoned others (socialists, communists, and Nazis) in concentration camps, abolished political parties and freedom of the press, and adopted a corporatist, clerical constitution. 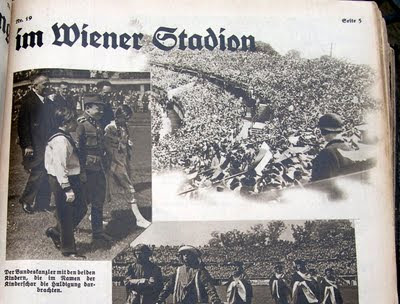 The Austro-Fascists also built up the Austrian army, held huge rallies with long rows of marching soldiers and huge flags, deployed propaganda, indoctrinated youth, and created auxiliary groups that reinforced the new ideology. However, they did not make anti-Semitism central to their ideology, nor did their threaten or try to undermine neighboring countries. A dead person moves among us. Tore the People out of discord and sleep. With Dollfuss in the New Age! Wir kennen nur die frohe Pflicht. Violence and lies don't scare us. We know only joyous duty. und nach dem Gestern weist. und will den neuen Geist. and requires a new spirit. From class hatred and tyranny. With Dollfuss in a New Age. 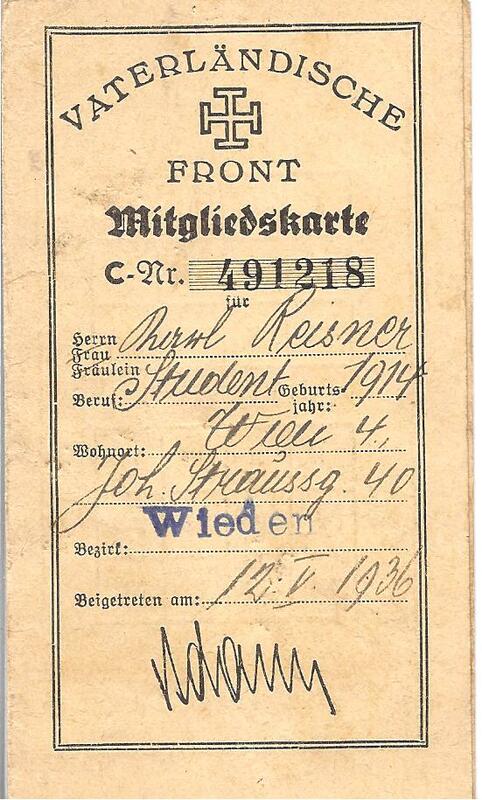 Austria's fascist leaders hoped the Fatherland Front would help protect the country from a German takeover. One of the main purposes of the Front was to instill Austrian patriotism and identity that had been missing since the end of the Hapsburg Empire. Nationalist and patriotic feelings had been diminished by the loss of the empire, the difficult economic times, and doubts about whether such a small country was economically viable. The new leaders wanted its citizens, especially its youth, to see themselves as Austrians with a proud past and a bright future. 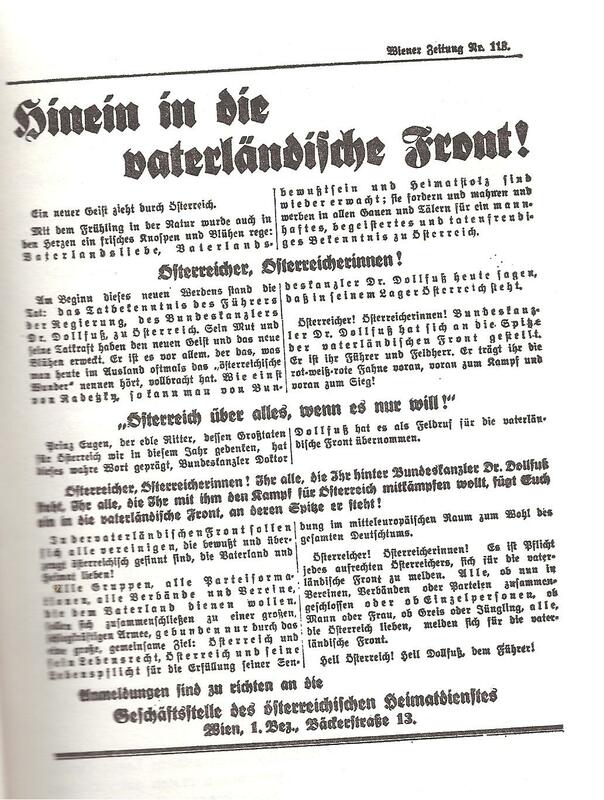 The announcement of the creation of the Fatherland Front in late May, 1933, (see above) spoke of a new spirit blowing through Austria, a new spring, based on love of the fatherland, consciousness of the fatherland, and pride in home. It declared, "Österreich über alles, wenn es nur will" (Austria over everything, if it only wants); these words were adapted from the Deutschlandlied, which begins, "Deutschland, Deutschland über alles, über alles in der Welt." "Österreich über alles, wenn es nur will"
The announcement said that Dollfuss, who is often referred to abroad as the "Austrian wonder," has awakened the new spirit and embodies it. "He is the leader and general of the Fatherland Front. He carries for you the Red-White-Red flag forward to battle, forward to victory." It urged everyone who stands behind Dr. Dollfuss and who will fight for Austria to join the Fatherland Front. To rally support, the Fatherland Front held large public rallies complete with flags, music, military marching, and solemn ceremonies, emulating (but not nearly equaling) those of Italy (which had pushed Dollfuss to demolish the democratic government and establish a fascist state) and Germany. It also organized auxiliary groups of boy, girls, women, workers, and others. 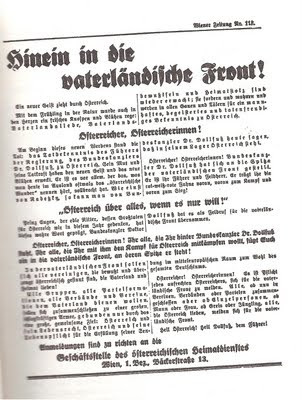 In November 1935, the Fatherland Front membership was over 2 million, and it rose more in the following years, until it was abolished after the Anschluss. 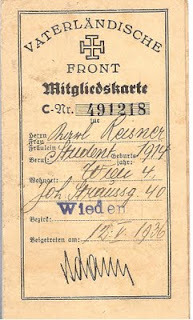 In all, over half of the population older than 18 years of age belonged to the Front. 5. To belong to no organization that wants class or cultural conflict or whose goals otherwise oppose the goals of the VG. 6. To give the leader unconditional trust and obedience. 8. 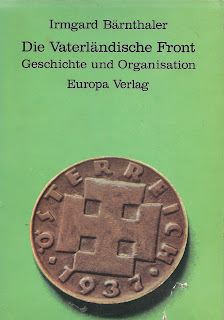 Wear and protect the insignia of the VG. 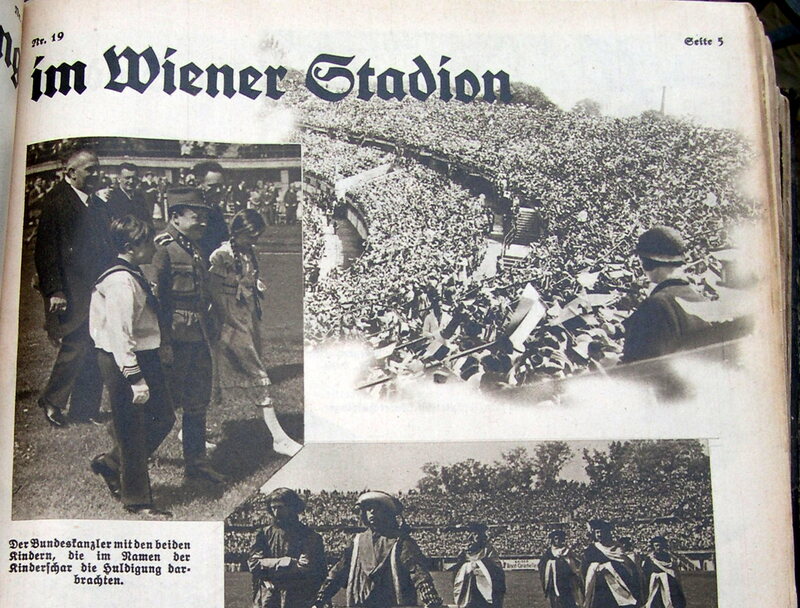 Though large numbers of Austrians joined the Fatherland Front, either out of conviction or necessity, it quickly disappeared -- along with Austria -- in March 1938 when the Germans arrived.